This blog was taken from "The Goosefather: Jan Huss"
John Paul II addressed a crowd in the Czech Republic, expressing “deep regret for the cruel death” inflicted upon their hero. “Deep regrets” were the very least the Catholic Church could offer. Lured to the Council of Constance under the promise of safety, Jan Hus was immediately thrown into prison for six months, given a mock trial, and ordered to recant — which he refused. In July 1415, he was stripped naked, adorned with a dunce hat painted with devils and labeled “Arch-Heretic” — all as he prayed for his enemies. They then led him past a burning pile of his books and chained him to the stake. In response to being chained up like a dog, he said, “My Lord Jesus Christ was bound with a harder chain than this one for my sake, so why should I be ashamed of this rusty chain?” They told him once more to recant, but he refused, proclaiming, “What I taught with my lips I will now seal with my blood.” And that he did. As the flames climbed higher, he sang. The secretary of the council pronounced, “O curse’d Judas, because thou hast abandoned the pathways of peace, and hast counselled with the Jews, we take away from thee the cup of redemption.” Thankfully, the Catholic Church did not have the authority to take the cup of redemption that day. After his death, outrage filled Bohemia. In his name, followers revolted against Rome in violent protest that lasted for over a decade. 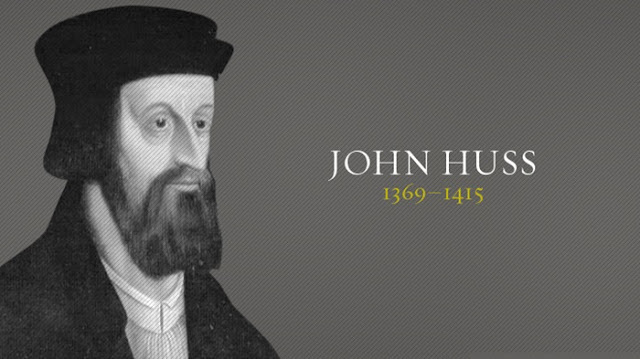 Jan Hus was a preacher, a political figure, a prophet, a proto-Reformer, and a martyr of the first class. Around 1369, a goose was born in gooseland. Jan Hus (Czech for goose) was born in Hussinec (Czech for gooseland) in the Kingdom of Bohemia. Born into a poor family, the goose left the gaggle for the priesthood in search of a better living and prestige. He came to be a renowned preacher at Bethlehem Chapel, but spent much of his time serving in academia as the dean of the philosophical faculty in Prague. Living in a time of social unrest between German speakers and Czech citizens, Hus became a key figure for Czech nationalism. Hus lived in a time when immorality infected the priesthood of the Catholic Church. He soon began preaching “violent sermons” against the rampant iniquity of the clergy until they reported him to the archbishop and had him banned from preaching. As Hus read Scripture and watched the popes of his day abuse their power, he concluded that papal authority was not ultimate. He needed a sturdier foundation than was built from the straw and sticks of men’s opinion — no matter how highly regarded those men were. He built his life and ministry on the word of God. His views about Scripture’s ultimate authority were set ablaze as he began to read the condemned works of John Wycliffe. Wycliffe found a loyal disciple in Hus. Hus defended his works with such tenacity that one historian called Hus “Wycliffe’s bulldog” (The Unquenchable Flame, 30). He staunchly argued against indulgences, advocated for both the bread and the wine to be served in communion, and preached in the common language (as opposed to the untranslated Latin of the day). Although still in agreement with the Catholic Church on matters such as the Mass, his allegiance to the teachings of Wycliffe got him excommunicated, tried for heresy, and burned alive. After Hus was finally condemned to death, he proclaimed, “You may roast the goose, but a hundred years from now a swan will arise whose singing you will not be able to silence.” Exactly 102 years later, a sprightly monk nailed ninety-five theses to Wittenberg’s door. He too, seeing the discrepancy between Roman doctrine and Scripture, sought to reform the Catholic Church. He too was led to challenge the pope. And he too was condemned as a heretic. During the Leipzig Debate, Luther was disparagingly condemned as a “Hussite.” He rejected the title in the moment, but took time to read his works during an intermission, returned, and commended the teaching of the condemned Hus. Luther was Hus’s swan, and would later own the association. He’s often painted with swans to this day. The Goosefather, a prominent forerunner to the Reformers, stood his ground and was martyred. The Swan followed the Goose, and Rome still has not silenced him.